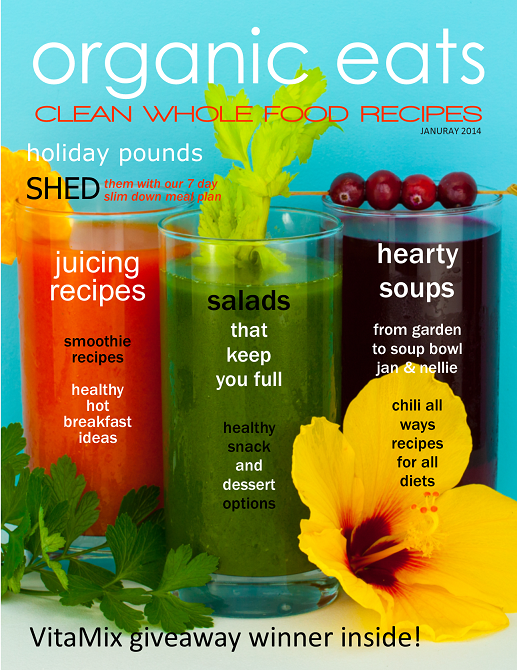 Organic Eats Magazine is now available on Kindle Fire and Nook for $2.99! The January issue is packed with lots of great recipes! Plus, chili recipes for all diets! Whether you follow a Paleo or Primal Diet, a Vegan or Plant-based diet, or eat a traditional diet, made healthier, we have recipes for everyone! And be sure to check out all of the great Paleo and Vegan soup recipes From Garden to Soup Bowl. They’re perfect for the 7 Day Slim Down Meal Plan or anytime you want a quick, warm, and satisfying meal. The magazine will be updated on January 15th, 2014 with the new prize giveaway entry form link. So be sure to watch your inbox. Not a subscriber? No problem. Get your complimentary 1 year subscription at OrganicEatsMag.com, so you don’t miss out.